Bike lanes were ubiquitous in Cambridge and the City was bikeable. I was a bit surprised to see as much bike traffic as there was and part of the traffic was on the City bikeshare system. One of the detractions of the system in Cambridge was the amount of construction that was happening due to the biotech sector growth surrounding the campuses of MIT and Northeastern University. 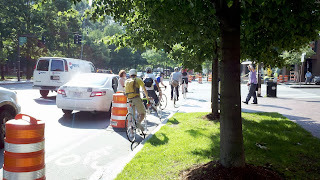 The construction was commonly happening with barrels in the bike lane and often restriction of pedestrian crossings. We have the same problem in the City of Portland, but it was something that clearly was happening on some of the busier bicycle corridors. 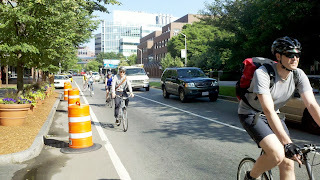 One treatment that was different than we would use in Portland was the Bicycles May Use Full Lane sign.